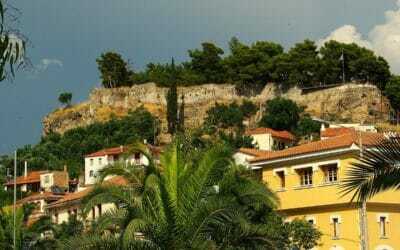 A castle with a rich history on a rocky hill at the NW side of the city of Kalamata. 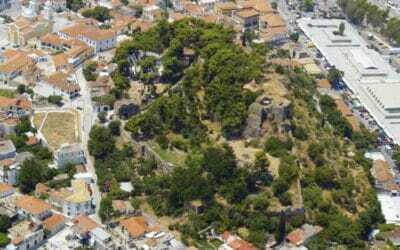 An ancient acropolis existed on the hill before the Trojan war, and later a Byzantine fortress, but the ruins we observe today are the remains of the castle that was (re)built there in the beginning of the 13th century, during the Frankish occupation. In the 6th century AD., a church was built in the castle devoted to Virgin Mary. An icon of Virgin Mary in the church became famous as ‘Kalomata’ (meaning ‘beautiful eyes’). 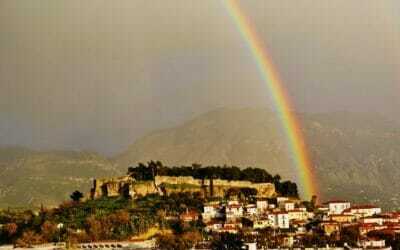 This later evolved to ‘Kalamata’ which became the name of the church, the castle and the city.